Today is the Feast of St. Catherine of Siena, an Italian saint that worked tirelessly for God by advising and interceding on behalf of her Popes. Yes there were two at the time of her work here on earth. In the 1300's a schism divided the Church and Pope Gregory XI was at Rome while Pope Urban VI was at Avignon. It was Catherine that persuaded Gregory to return to Rome. She sacrificed herself for the peace of souls with her personal prayer and diplomacy. Much like St. Elizabeth of Hungary, St. Catherine had a huge heart for the poor and baked bread daily for the poor of Siena. In honor of her Feast today, why not try some of this scrumptious bread. I'm calling it St. Catherine's Peace Bread for her great contribution to bringing peace in the fallen world of her times. I hope you'll try it, it's classic Itialian!! Many blessings on this glorious Feast day! For the Sponge: Make up to six hours or overnight ahead. Dissolve the yeast in warm water stirring with a wooden spoon. When the yeast is dissolved, stir in the flour. Cover with a damp kitchen towel and set aside to rise in a room that is on the cool side (60-70 degrees is ideal). When you're ready to bake, add 1 1/2 cups warm water and 2 cups flour to the sponge. Stir to mix well. If you wish to set aside starter for the next baking, transfer 1 cup of the mixture to a glass jar or bowl, cover tightly, and store in the refrigerator. Add 1 1/2 cups more flour to the remaining yeast mixture along with the oil and salt. Stir to mix well, first with a wooden spoon, and then with your hands. Spread the remaining 1/2 cup flour on a bread board and turn out yeast mixture. Knead very well, incorporating the flour on the board for about 15 minutes. (Or you can cheat like I do and do this in your Bosch Mixer or Kitchen Aid with a bread hook). When dough is smooth and elastic and satiny, return it to the rinsed bowl which has been wiped with the olive oil. Turn the dough in the bowl to coat it and cover with a damp cloth. Set aside to double in bulk for about 2 hours. Turn dough out on floured board, punch down and knead briefly. Spread dough out and scatter the pitted olives over it. Now gather the dough together and knead just enough to distribute the olives throughout. Form two round loaves and set aside for another 30 minutes of rising. Preheat to 425 degrees and bake for 35 minutes or until the bread is golden brown and crusty and feels hollow when you rap on it. Turn out onto a rack and leave for at least 2 hours before cutting. I look forward to hearing about how your Peace Bread turns out. It would be a wonderful thing to share one with someone less fortunate for this special Feast of Saint Catherine of Siena!! Two weeks is Pentecost, which for the Portuguese is also time for Holy Ghost Sopas! If you live anywhere near a Portuguese community you know what I am talking about. All over the country there are huge festas that the Portuguese Americans host and each one of these you are going to find Sopas. The best recipe for Holy Ghost Sopas I have found is in the cookbook: Foods of the Azores Islands by Deolinda Maria Avila. This is not easy to get your hands on but it is very worth it. There are some great holiday foods in here, which often have religious significance. Bring water to boil and add meat and spices tied in a cheesecloth or in a tea ball. Cook about three hours until meat is tender. Cut cabbage into fourths and add to pot. Cook for about 15 more minutes. Meanwhile, slice bread and place in 9x13 pans. On top of bread place mint springs. You don’t need a lot, just a few two or three per 9x13 inch pan. When meat and cabbage is done, remove tea ball and pour broth over bread. Serve with meat and cabbage. Now, some people might think… wet bread?? Oh yeah! I couldn’t believe it either the first time I tried it, but honestly that is the yummiest part. You will start stalking Portuguese people trying to find out when the local festas are! There is a tradition in some areas of picnicking on hilltops on the Feast of the Ascension. Both The Easter Book by Fr. F.X. Weiser, and Florence Berger's Cooking for Christ share this traditional activity to commemorate the feast. We have incorporated this tradition for our family in the last couple of years. With Easter so much earlier this year, the end of the Easter season feasts are early as well. The weather in your area may not be conducive to a spring outing, but if it is, a spring hilltop picnic might be something to consider in your plans for this week. Even if you don't have a real hilltop nearby, just find the highest elevation around. It was suggested by a member on the 4 Real forums that a ride in a glass elevator on this day would be helpful to illustrate ascending as well. You could picnic on the top floor. It could be on Thursday which is the traditional 40 days after Easter when the Ascension feast was celebrated or over the weekend, specifically on Sunday when we celebrate liturgically the Feast of the Ascension. What would the menu for an Ascension picnic include? There is not a set menu, but it is traditional to eat a bird of some sort (pigeon, pheasant, duck) since Jesus "flew" to heaven. In our culture chicken or turkey might be more common and available even though they are not know for their flight abilities. I love all the ideas for St. Mark's feast day! Since Jessica had commented that so many of the recipes from Cooking with the Saints were complex, I thought I should put in a plug for this one recipe for St. Mark's Feast Day. I tried it two years ago, and mentioned it on my blog. This makes a lot of pasta and vegetables, so next time I would definitely cut back. If you're abstaining from meat, I'd either save this for Saturday or skip the chicken and make it a vegetarian feast. But it's really, really delicious! Preheat large, heavy skillet with tight-fitting lid, or large heavy pot with lid, over moderate high heat and add oil. Add chicken to pan when oil is fragrant and sauté, stirring and turning frequently for 5 minutes until browned on all sides. Add onions, carrots, and celery and sauté until onion becomes translucent. Add garlic and sauté for half a minute. Add chicken stock and loosen ingredients off the bottom of pan. Add final ingredients, stir and put on gentle simmer and cover for about 10 minutes, stirring occasionally. The chicken should be tender, but not soft. Adjust seasoning to taste. Meanwhile, cook the pasta. When finished, add olive oil and toss to prevent it from sticking. Prepare the vegetables, julienne strips for the peppers, small florets for the broccoli, 1/4 inch thick slices and halved for the yellow squash and zucchini. Add olive oil to a heavy saucepan and sauté the vegetables until just crisp-tender. Mix together pasta, sautéed vegetables and sauce in large bowl and serve promptly. This should feed about 8 people. I don't limit myself to the actual feast day for celebrating with food. Sometimes we can't always do it all in one day, but if it's an important feast day, or if it's enjoyed by my son, we spread out the celebration and discussion. And even my favorite cookbook author, Florence Berger mentioned how she saves a recipe for later in the year. The lion cupcakes are so cute! To continue the lion theme or finding other animal cakes for other feasts (and perhaps a retro adventure), first see Helen McLoughlin's Lion Cake from her book, My Nameday, Come for Dessert. It wasn't until much later that I realized that the ideas for her cut-up cakes came from Baker's Coconut little booklets, such as this one, Animal Cut-Up Cakes. I love the idea of cutting up a cake to make unique creations (very frugal and creative), but I'll hold back on the coconut. It is very exciting to be part of this blog - which is a fabulous resource for celebrating the liturgical year in our homes and kitchens. Thank you to Jessica for making this idea a reality and thank you for inviting me to contribute. Jessica mentioned the lamb cupcakes for the Annunciation being part of an "in like a lion out like a lamb" set from Martha Stewart. So to keep the set together here is another chance to convert it to a liturgical year theme. How about some lion cupcakes to celebrate the Feast of St. Mark - evangelist, apostle, martyr (April 25). St. Mark is often pictured with a lion, particularly a winged lion. Tradition has long connected the authors of the Gospels with the four creatures in Ezekiel and Revelation. St. Mark is represented by the winged lion because Mark's gospel begins with the description of John the Baptist as a "voice of one crying out in the desert" and because he presents the Lord as the unconquered King. So to incorporate this symbol into a feast day celebration you could try some lion cupcakes. You could use the lion paired with the lamb from Martha Stewart , but we opted for these caramel corn lions since we are not big coconut fans. The cupcake lions could also be used for the Feast of St. Jerome (Sept. 30) or if reading Daniel and the lion's den. Make cupcakes in the flavor of your choice. We used butter cream frosting with a slight tint of brown food coloring for a golden colored frosting. Molasses could also be used to achieve the coloring. Frost cupcakes and pipe on eyes and mouth with a darker brown or chocolate frosting. Circle each cupcake with caramel corn to make the mane. You can purchase pre-made caramel corn or use this easy (and delicious) recipe to make your own. I was thinking the recipe could be used again for the Feast of Our Lady of Mount Carmel (okay, it's a stretch, I admit). Cook syrup, brown sugar, butter, and salt in microwave, on high for 2 minutes, stir once. Add baking soda and vanilla. Stir well. Place popcorn in a large brown bag; pour syrup mixture over popcorn, stir a with wooden spoon. Roll up top of bag and put in microwave. Cook on high for 1 minute. Shake and repeat (but shake after first 30 seconds). I have to thank Jessica for inviting me to be a part of this terrific idea. I'm honored to be a part of these very inspiring women. I had a few additional thoughts about this feast of St. George. Last year we missed celebrating this feast, but I can't let it pass without doing a little something to honor this soldier-saint. My 4 year old son is a typical boy, playing knights and soldiers to his heart's content. Ann Ball's Catholic Traditions in Cooking goes away from the English tradition and presents Gazpacho and Moros y Christianos, Spanish dishes, to celebrate the day freed from the Moors. Roast Beef and Yorkshire Pudding is very common on this day in England. But any good English recipe, like fish and chips or shepherd's pie would be good. There is also a Melachrino Cake from Greece served on this day. Ann Ball has a simpler recipe than Cooking With the Saints. I was continuing the idea of a dragon theme. 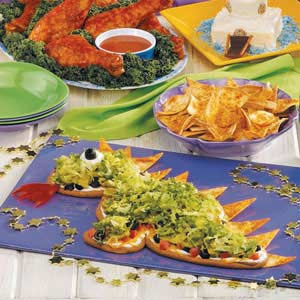 Matilda's dragon cake is just so awesome, but for some other fun, how about Taco Dip Dragon? I also found a Dragon's Breath Dip, but that isn't as colorful. Now how about a Red Dragon Pie instead of Shepherd for this day? As for me, I served my roast beef yesterday. I'm going to incorporate skewers or toothpicks in my meal, either with the meat or the fruit for dessert, so we can mimic St. George slaying the dragon. I wish I knew of a source for those little swords that are used for cocktail drinks, as there are quite a few feasts we could use those! Tomorrow, April 23rd, is the Feast of St. George. Since St. George is often associated with England, you could even choose an "English" theme! Here is a link to many English recipes... As for our family, I'm thinking we will be having some English Fish n' Chips! Yum!!! If your looking for a dessert to go with those Brats, don't miss Margaret's recipe for Popecakes! Now that you have had your French breakfast in honor of Saint Bernadette, what for dinner? Well today is our beloved Holy Father, Pope Benedict XVI’s 81st birthday. In honor of our Papa’s birthday how about a German dinner? I am not going to give you any fancy recipes, because I tend to stick to the experts when it comes to foreign cooking. We were blessed to live in Germany for a few years and I learned from my sojourn there all about the Brat. Bratwurst is a wonderful German sausage. I highly recommend getting them from a proper German butcher, if you are lucky enough to have one locally. If not, you must go with whatever you can find at the supermarket. 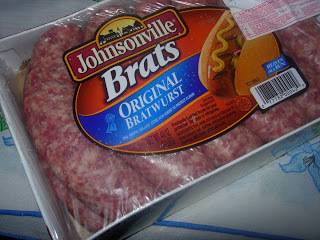 Brats are not like hot dogs. You don’t just pop them in the microwave for thirty seconds and voila, you have a meal. Now, Brats require some love and attention. You must first boil some water. If you want to go all out you will boil them in beer! If you really really want to go all out you get German beer. But in honor of our German Pope coming to America, I am using Bud. You can do a mix of beer and water, which is my recommendation. You want more water than beer. Now put your water and beer on the stove in a large pot. When it starts to boil (quick, because you do not want to know what happens to beer when it boils for any length of time, it is not pretty) take it off the heat, pop your Brats in there and cover for 20 minutes. While this is happening heat up your griddle, nice and hot. You can also do this on the stove, but I like the even heat of a griddle. You could also barbeque, but that is so American… and also you will more likely burst the skin and burn your beloved sausage. Butter is very important. Do not spray with Pam. This is not healthy eating, so don’t pretend it is. Butter your griddle, till it is nice and shiny. Place Brats on the griddle. Once browned turn and brown the other side at well. Make sure there is enough butter to make the browning nice and lovely. I would highly recommend serving these on homemade bread, but you can get some crusty rolls from the supermarket and serve your Brats on that. Now, this is another matter of contention. Where I lived in Germany (northern Bavaria) all you put on your Brat was spicy mustard. That is it. When we returned to the states however some people threw a little shindig for us and made Brats and served them with sauerkraut too. Which is divine. If you have to have ketchup… well, just don’t. Shame on you for even suggesting it. There you go an authentic German Brat! Happy Birthday, Our Beloved Pope! First of all, let me say "thank you" to Jessica for providing such a lovely place to gather and for inviting me to contribute. I am putting together this post from my archives since I won't be making our dragon until the day before or maybe the day of St. George's Day this year. My oldest son has always loved St. George. We even had a father/son party once with a homemade dragon pinata. The little boys loved it and I think the Dad's did too! Last year, we kept things very low key. I made a dragon shaped cake for the children to devour and you can do the same with a box cake mix, a couple of cans of frosting, food coloring, a package of Ding Dongs and four Hershey's kisses. I used the Ding Dongs, cut in half, to make mounds on the head for the eye sockets and the feet. Cut them into triangles and they can be extra spikes. Toothpicks help hold them in place. Frosting will cover so many mistakes so never fear if it doesn't look pretty at this stage. The eyes and nostrils were made by inserting the pointy end of a Hershey's kiss into globs of frosting. The final touch was turning butter knives into kid friendly swords with some strips of tin foil to hack away at the more cute than ferocious beast. Here is another variation for those who need more visual assistance. That would be me! I am such a visual learner! Happy baking! I want to thank Jessica of Shower of Roses for inviting me to be a guest author here at Catholic Cuisine. I hope to post some of our recipes and liturgical ideas throughout the year for you to try with your families! I feel blessed to be part of this lovely sharing blog! Here is a very easy and lovely meal that can be prepared for the Feast of St. Bernadette which we celebrate tomorrow April 16th. I first posted this celebration at Sweetness and Light titled Crepes for St. Therese, hence the statue of St. Therese. Blend first three ingredients until frothy, add last three ingredients and blend until you have a nice smooth pourable batter. Pour about 1/4 cup batter onto a med-high heat griddle or very large non-stick saute pan. (You need room around your crepe to get your spatula under it to flip) Use a spoon to lightly swirl your crepe into a large disc, be careful not to tear the batter, if you happen to, just spoon a little batter into that spot :) Cook for about 30 seconds on each side until lightly golden, and then stack 'em up on a platter for serving at the table. I hope you enjoy these as much as we do and please share your results if you try them, they are a mainstay in our family celebrations!! Again from skiptomylou, again for St. Patrick's Day, again it can be altered to fit other feast days (red for St. Valentine, blue for Mary, etc). How fun would it be to eat this while watching a movie about that day's saint!? I ran across these on skiptomylou and thought it was a great idea. They could be used for any feast day really (just change the color of the paper), these were designated for St. Patrick's Day (hence them being Blarney Biscuits). Click picture for recipe, or follow your own recipe and just use the idea. She also has a great Blarney Stone craft, click here. When you buy the cake mix. There is a recipe on the side of the box for making it the upside down way. Basically you just add 1/2 cup of butter into the baking pan after you grease the pan with Crisco. Then put 1 cup packed brown sugar evenly covering the bottom of the pan. Then add the pineapple circles and cherries however you like. Then mix the cake mix as directed and pour it into the pan, covering the pineapples and cherries. Bake as directed according to your pan size. I used 2 circular 8 inch baking pans and baked it for about 35 minutes at 350. This is great if you have one of those busy days and can't spend a lot of time in the kitchen. You can still use easy meals to teach about our liturgical year! P.S.- This is also a great time to teach a toddler or pre-schooler about circles, the letter O or the number zero. Have fun!